SV102ED on M1 mount and tripod. Illustration courtesy of Stellarvue. The SV102ED was added to the Stellarvue line in 2007. Like all Stellarvue telescopes, the SV102ED is a compact, short focal length refractor. Stellarvue's company philosophy includes the proposition that, "A telescope that is easy to use will be used often" and we are inclined to agree. "Stellarvue telescopes are made with exceptional mechanical and optical quality. Each telescope is easy to set up and immediately use. We use proprietary lenses that provide exceptional wide field and high power performance. Each telescope is triple testing including a star test to assure the highest performance." Optical tube length - 19.25" with focuser unthreaded; 23.75" with focuser attached; 28.25" with focuser attached and dew shield extended. The SV102ED reviewed here was purchased as a basic telescope, per the description above, without a mount or accessories, but with the optional Feather Touch two speed focuser. However, it can also be purchased as the SV102ED Complete System. 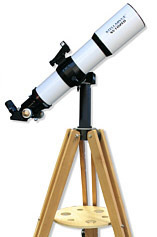 The specifications for the telescope remain unchanged, but the Complete System includes a Stellarvue M1 "grab and go" alt-azimuth (A-Z) mount, StellarVue 1.25" dielectric star diagonal, Stellarvue 23mm E3023 (three element) ocular and an American made alder wood tripod with appleply tray. The SV102ED Complete System is easy to use and lightweight at only 25 pounds. For this review, the SV102ED was mounted on Stellarvue's M1 alt-azimuth mount and tripod with tray. The M1 is a stable mounting system that includes paddle type locks and slow motion controls. We had a wide variety of high quality 1.25" and 2" oculars available and Stellarvue 1.25" and 2" dielectric star diagonals to match. The first impression of the SV102ED is that it is a well-made, top quality refractor. Both the scope and its associated Stellarvue accessories show a commendable commitment to design and manufacturing excellence. A quick star test verified the scope's perfect collimation. As soon as the August weather and viewing conditions in western Oregon permitted, we took the SV102ED to a (relatively) dark sky viewing site about 18 miles east of Pleasant Hill, located in the foothills of the Cascade Mountains. This site is far enough from the nearest city (Eugene) so that sky glow was not a problem and the moon was in its "new" phase and did not intrude. To keep the SV102ED honest, we had along two other ED refractors, one less expensive and one more expensive. The former, with a 2009 MSRP of $999.99 (including CG-4 mount and tripod) was a Celestron Omni XLT 102ED (4" ED doublet objective, 900mm focal length) and the latter a Stellarvue Raptor 105 (4" APO/ED triplet objective, 735mm focal length). Like the SV102ED, the Celestron 102ED is built on an aluminum tube, while the Raptor is built on a carbon fiber tube. The Raptor carries a hefty 2009 MSRP of $2595 (optical tube only) and is in every way a no compromise, deluxe telescope. Note that, due to the differences in focal length between the three scopes, a fair and objective direct comparison was not possible. The Celestron and the Raptor did, however, serve as general references. Also present was a Meade ETX-90 telescope on a computerized fork mount. This 90mm clear aperture, 1250mm focal length Maksutov-Cassegrain design offers very good optics for its type and price (about $600), but it quickly became apparent that it was outclassed by all three refractors and it got little subsequent use. The Stellarvue Raptor 105 used a heavy duty Stellarvue MG alt-azimuth mount, while the Celestron 102ED was on its supplied CG-4 German equatorial mount equipped with accessory drive motors for both RA and declination. The Stellarvue MG mount/tripod is a bit steadier than the Celestron CG-4 and dampens vibrations a bit faster, but both are good, solid mounts for visual observation. The CG-4's sidereal rate RA motor allowed it to track objects once they were acquired, eliminating the necessity to continually "touch-up" the scope's aim. Of course, an equatorial mount takes longer to initially set-up than an A-Z mount. We were able to view a reasonable number of objects over a period of several hours. The best known of these included the Andromeda Galaxy (M-31), Hercules globular cluster (M-13), Ring Nebula in Lyra (M-57) and the planet Jupiter with its four large moons. We successfully split double stars with all three scopes, including the component binary pairs of the "Double Double" in Lyra and the beautiful blue/gold pair that comprise Alberio, at the foot of the Northern Cross. Splitting Alberio is no great feat, as the component stars are 35 arc-seconds apart. More significant is that the SV102ED showed the pale gold and pale blue color of the two stars. The binary pairs that comprise the Double Double are a sterner test of small telescopes, as these binary pairs are only 3" and 2" apart but the SV102ED was up to the task with 14mm and shorter oculars. Star images were pinpoints of light without noticeable optical aberrations. Deep sky nebula are, in general, dim and there is a limit to what any 4" telescope can do, because of its limited light grasp. What one scope could see, the other could see. Suffice to say that these are very good 4" scopes, clearly superior to the 3.5" Meade ETX and other 3.5"-4.5" catadioptric and Newtonian reflector scopes we have owned and used. Perhaps the biggest difference, and even then it was relatively minor, was in resolving individual stars on the fringe of the great globular cluster M-13. All three of our refractors could resolve some individual stars, but the two Stellarvue scopes seemed to present slightly sharper and contrastier views and they could see a little farther "into" the cluster. They were also initially operating at somewhat higher magnification (70x compared to 65x for the Celestron) and higher magnification, as long as the scope's optics and the seeing conditions are good enough to take advantage of it, is always subjectively better for resolving fine detail. Switching oculars to bring the Celestron up to 75x considerably evened the visual playing field. Note, however, that the Celestron 102ED required about 6.66% more magnification to show approximately the same amount of detail as the Stellarvue 102ED. At no time were we troubled by chromatic aberration in any of these scopes. Even while viewing the very bright planet Jupiter, we noticed no lateral color error in the SV102ED. We could see up to five cloud bands during the brief periods when the atmosphere steadied. On a bright object like Jupiter, you can benefit from extra magnification and the Stellarvue scopes tended to be able to operate at slightly greater magnification, a tribute to their exceptional optics. To summarize our viewing results, the SV102ED is an excellent small telescope. Its optics are probably slightly superior to the Celestron XLT 102ED, as befits its higher price, and its 2", dual speed Feather Touch focuser is more refined and easier to use. The Celestron has a good 2" Crayford focuser, but it is inferior to the SV102ED's dual speed focuser. The Celestron's rigid metal dew shield threads into the front cell, while the Stellarvue's dew shield retracts. The XLT 102ED's plastic front lens cap simply slides over the front of the dew shield, while the SV102 comes with a threaded metal lens cap. The most important difference between the XLT 102ED and the SV102ED are not the objects they can view, but the superior refinement of the latter. The Raptor 105 is the ultimate in small refractor refinement, even more so than the SV102ED, and it comes with an APO objective, lightweight carbon fiber main tube and a 3" Feather Touch dual-speed focuser. Optically, however, it was hard to tell the two Stellarvue scopes apart. That is a real tribute to the excellence of the SV102ED's design and assembly, for the Raptor 105 is a true, three element, apochromatic refractor with an ED glass center element. No doubt, there is some critical application for which the Raptor 105's optics would prove at least slightly superior, but we did not encounter it in the course of this review. Our conclusion is that the Stellarvue SV102ED is an investment in fine optics and precision assembly that will satisfy most purchasers for a lifetime of observing. At its base price of $995, it's a bargain!